Commitment and consistency is a psychological tendency that people have to always ensure consistency between actions and promises and their inner values and belief systems. It is one of Robert Cialdini’s 6 principles of persuasion and can be a powerful influence on our behaviour because of the importance of our self-image. Commitment is the key driver of consistency. Consistency is perceived to be a valuable personality trait. People will sometimes even go against their own beliefs to be perceived to be consistent. Asking people for a favour can create that sense of commitment as it can change their self-image (e.g. I’m someone who gives to the needy). Ask a question that says something about the type of person they are. Start with a small request and people are more willing to comply with a larger request later. Getting people to write something complementary about your brand helps to improve their perception of your product or service. People assume that what people write reflect their beliefs about a topic. Get staff to set their own targets and write them down on paper to benefit from commitment and consistency. 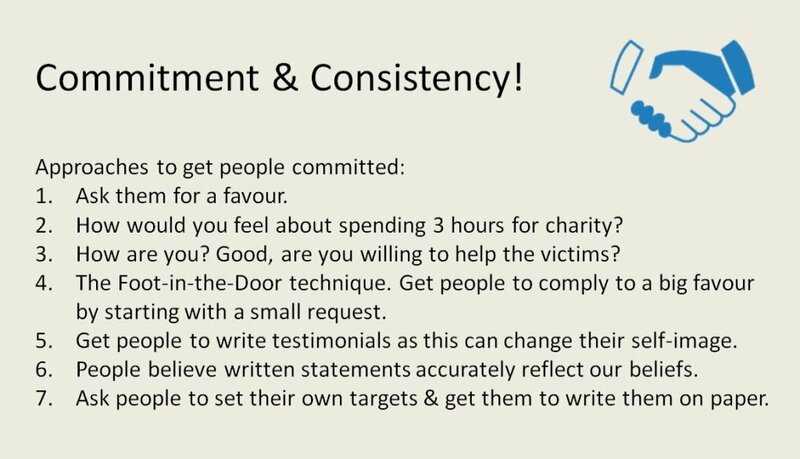 Commitment and Consistency – What is the most powerful weapon of persuasion?